Sisters are so special! One of my customers asked me to send a Gift Certificate to her Sister for her birthday. I couldn't just send a piece of paper and so this is the gift card I made for the certificate. 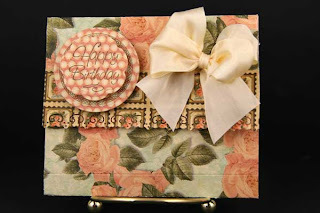 The roses are from the 8x8 La Romatique paper pad by Graphic 45. The back side of the paper had a bride on it, so I lined the paper with a coordinating color. A border was cut out of another sheet in the same collection and attached at the bottom to overlap the top. , I stamp the Happy Birthday stamp from JustRite's Just A Note Stamp Set and cut it out using the Blossom Nestie. The border was stamped on a separate sheet and cut out with a larger Circle Nestie. Both were popped up with the Therm-O-Web Dimensional. A silk bow gave it the finish touch. This is the inside of the gift card. I used Score-Pal Scoring Tape to attach the sides, making a pocket to insert the Gift Certificate. I didn't notice until I was posting this picture that my adhesive square is crooked. bummer!!! I have on order some circle Velcro dots for the next gift card I make. I think it will work better. I'm sure your customer's sister is going to be thrilled when she receives her gift certificate Joan, what a beautiful presentation! I agree with Jerri. I'd be happy and proud for both gifts. From you and the sister. I agree with Jerri too. This is so gorgeous. Love your thoughtfulness and personal touch Joan. Awesome idea Joan! 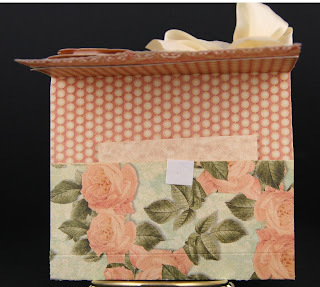 I need something like this myself ... thanks for the wonderful creation to case! They are going to be thrilled with this and of course I love that beautiful ribbon bow!! this is perfect Joan..I love it- think I am gonna case it! tfs! Imagine my surprise - first when I opened the envelope from Joan and saw the enclosed gift card, and then just now when I logged on to Joan's Gardens to start shopping!!! As the lucky recipient of this gift card, I can tell you it is absolutely gorgeous! It's so much prettier in real life, and really is an incredible presentation. A couple of my local stamping friends took me to lunch for my birthday yesterday, and you can bet there were some oohs and aahs when I showed this to them. Beautiful gift certificate holder! And...how thoughtful of you! Hugs!! Beautiful, Joan....thanks for sharing...I will definitely try this the next time I give a gift card. Great idea. and so very PRETTY! I'm sure your customer's sister will be so thrilled to receive this gift of your generous thoughtfulness.Thanks for the inspiration. Oh My. I plan on letting my kids know that I want a gift card from your store if you're gonna be so generous.